Disney has released a great collection of Winnie the Pooh movies on DVD and it is called "Winnie the Pooh: A Valentine For You." The DVD is a collection 3 movies, the first one is "A Valentine For You" released in 1999. In the movie Christopher Robin catches a "love bug" and Pooh is of the thought that "We must take him to the doctor!" Rabbit's response is equally funny, he considers the love buy to be contagious and thinks that Tigger, Owl, Piglet and Eeyore along with Gopher must think of an idea to "cure" their trusted friend Christopher Robin. The movie has a number of musical sections which fans and kids will surely enjoy. The 2nd movie is a short animation movie called "Un-Valentines Day" released in 1995. The movie revolves around Rabbit calling for a meeting of the inhabitants of the Hundred Acre Wood and then gets all members to agree on not celebrating Valentine's Day. The reason being that in the previous year Eeyore did not give Valentine's Day cards to anyone and Rabbit in particular felt bad about it. But surprisingly Valentine's Day cards and gifts start showing up. The first card and gift appears at the front door on Winnie the Pooh's house and later at everyone else's house. This leads to a surprise ending and everyone is of the thought that it was Winnie the Pooh who broke the agreement first. Everyone then starts celebrating Valentine's Day with vigor. The third instalment in the DVD is another short animation movie name "My Hero" and is a new addition to the DVD adventure. In the animation movie Piglet helps save Tigger's life and Tigger is indebted to Piglet for this. Tigger wants to serve as Piglet's servant in order to repay Piglet for saving his life. But as the movie unfolds Tigger's help creates more problems for Piglet than do any good to him. Piglet is then left wondering what he can do to settle the matter for good. The DVD series also includes another short movie "Three Little Piglets", a retelling of Three Little Pigs, with three Piglets playing the Three Little Pigs. Every movie on the DVD collection is really a collectors' dream and fun for the kids to watch Winnie the Pooh. Catch the Love Bug Game - In the Hundred Acre Wood Flying Love Bugs are on the loose and onus is on you to get hold of as many as you can. 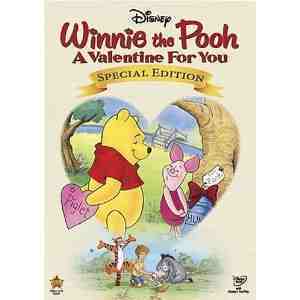 This Special Edition "Winnie The Pooh: A Valentine For You" DVD will be available starting January 5, 2010 at $29.99.